Sarawak sits on the north-western coast of Borneo. It became a Malaysian state when, in 1963, the British decided that it was too much effort and expense to lord it over govern the colony any longer and so the area joined with the new nation of Malaysia, also an ex-colony of Britain. The tiny sultan-ship of Brunei sits to the east, and Indonesian Borneo to the south. The state of Sarawak actually has a very interesting history, including governance by Brunei, followed by the rule of a dynasty of self-proclaimed white rajahs, the English Brooke family, who were Rajahs of Sarawak from 1842, for three generations – over one hundred years – before they ceded sovereignty to Britain in 1946. The interesting thing about the Brooke Rajahs is that they made some efforts to preserve the indigenous culture, protecting the population against exploitation, and encouraging them to maintain traditional ways of life, and as a result, there are still many indigenous tribes who continue to follow their cultural traditions; many more than in other regions of Malaysia. 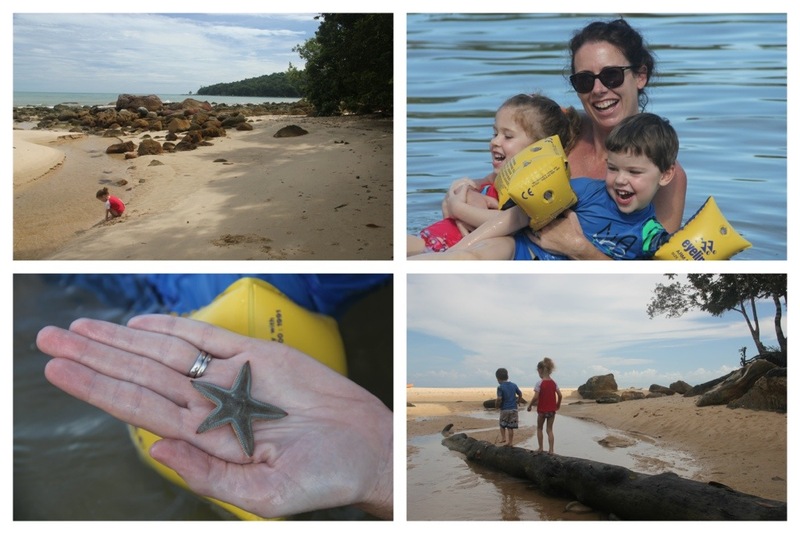 We wanted to take the kids to Sarawak as part of our Malaysian adventure, for a dose of wildlife-watching, some exposure to a little bit of traditional south-east Asian culture, and some beach-bumming, to break up the time we had in cities, which can be tiring for the kids. 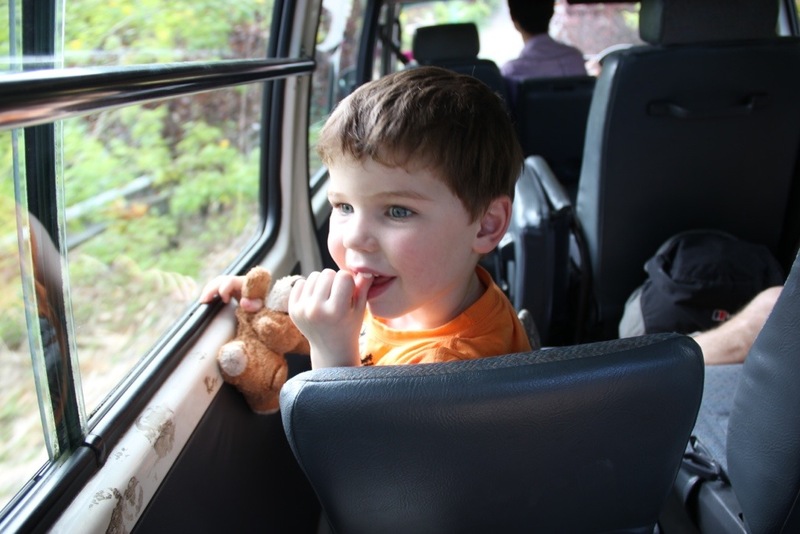 Having visited Sabah, the other state in Malaysian Borneo, on the north-eastern coast of the island, in our halcyon, carefree, pre-kid days, we were keen to go back and share the beauty of Borneo with the kids. We were also keen to visit our orang-utan friends. I. Love. Orang-utans. Especially when they’re not at the zoo. Following our adventures in KL, we hopped on another Air Asia budget special, and zoomed over to Kuching, the capital of Sarawak. More about Kuching, an absolute jewel of a city, in another post. 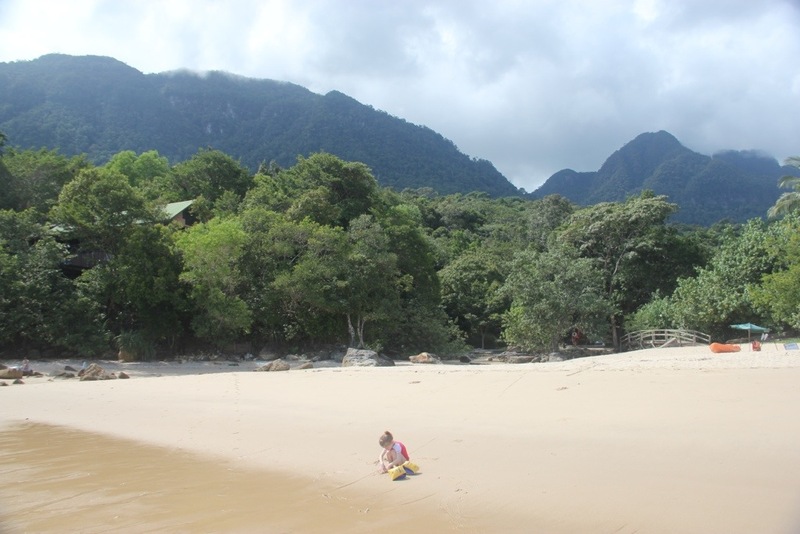 This one’s about our stay on the Santubong Peninsular, about an hour north of Kuching, on the coast. 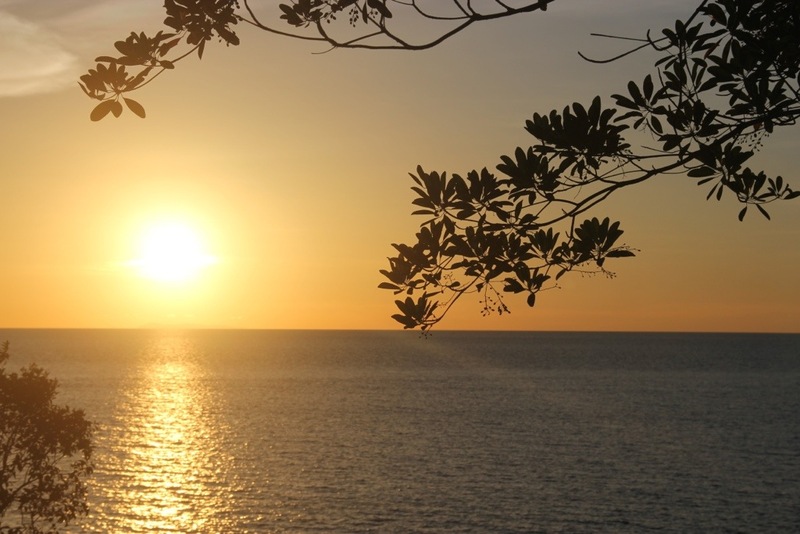 It’s an area where pristine rainforest meets clean sandy beaches, emerald sea, and a dash of indigenous culture. 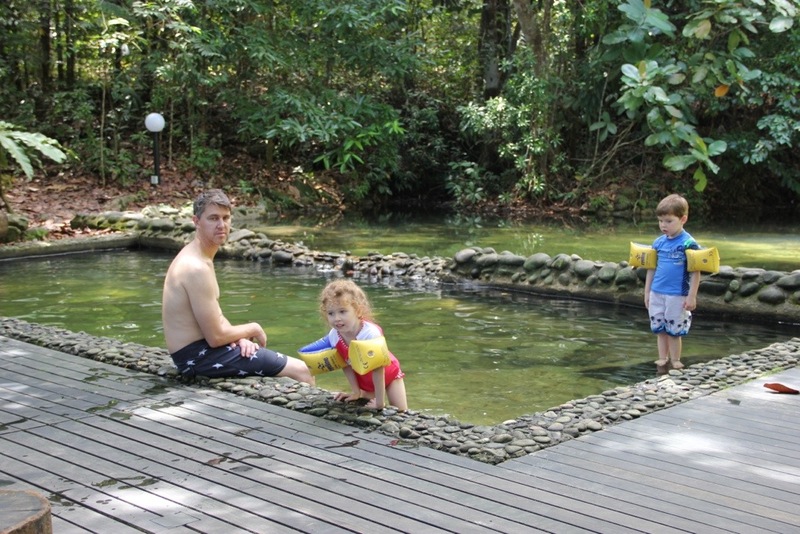 I’d booked three nights at the Permai Rainforest Resort before we left home, to make sure we had somewhere to stay. Being a small region, there were limited options within our mid-range budget, so I followed the advice of those who had gone before (Trip Advisor) and pre-booked our stay. We mini-bussed it out from Kuching, which was the beginning of the excitement for the kids, never having been in a mini bus before. As usual, getting there was possibly even more exciting than getting to the destination. Except the beds. Seeing the beds is ALWAYS most exciting. 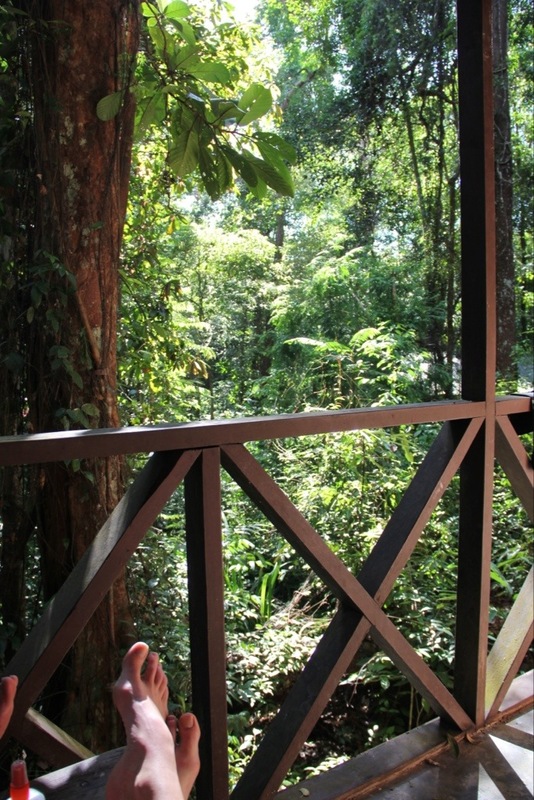 Now, when they use the term “resort” for Permai Rainforest, it’s in quite a loose sense of the word, but it was a VERY special place; pretty much paradise in terms of its natural beauty. 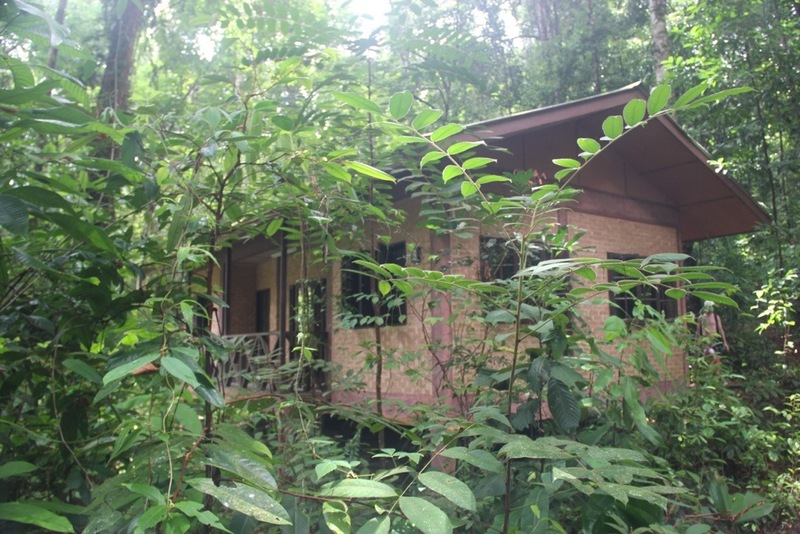 Our cabin was rustic, with six single beds and a creaky wooden floor, but its position was perfect, nestled snugly amidst the deep green of the dense rainforest, on a hill above a yellow sandy beach. We couldn’t see the beach from the cabin, but the view from our little balcony was superb nonetheless, as long as we were lathered in mozzie repellent. Day one, our first stop was the jungle pool, the only pool in the property, built into a cool, fresh stream that runs down from the mountain above. 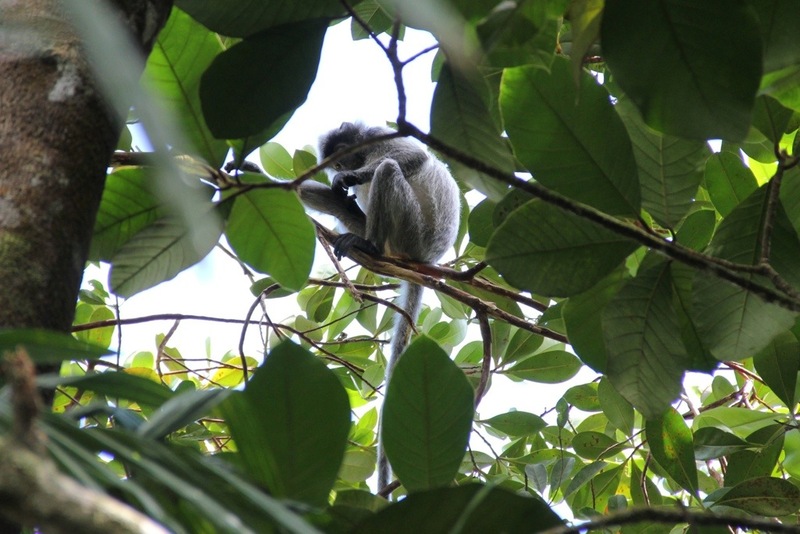 A group of inquisitive silver leaf monkeys arrived overhead, but kept their distance. We caught just a glimpse. The pool turning out to be a little bit chilly, we found the beach, and were bowled over by the beauty of the spot. The water was aquamarine, and crystal clear, and the green jungle rose up the mountainside, the perfect backdrop. Wispy clouds often hung about over Mt Santubong, and our cabin was hidden away in the rainforest behind the beach. The water was like a bath. Floaties on, the kids swam about in the shallows, only tiny waves lapping at the shore. It was difficult to drag them away. There was a little creek running out to sea at the beach, in which tiny striped fish swam, where the kids dug and built dams, and islands in the stream. We even found a living starfish in the water at the beach. We spent most of our time like this, just enjoying the place. The sunsets were impressive. If only I’d managed to get the horizon straight. I’ll blame the Tiger for that one, too. We had a minor scare on our first day when there was no beer at the restaurant at lunch time. I thought we’d ended up at an alcohol-free place, and was a little bit shaky. However, by dinner, the fridge was restocked, and Steve and I breathed a sigh of relief. Did I mention how beer is necessary for survival in the tropics? Here’s a random picture of Phoebs, because I can. The only difficult thing was that our cabin was maybe 500m uphill from the beach and the restaurant, so there was some complaining during the epic odyssey. It was hot and steamy, and a long walk for little legs to do multiple times a day. 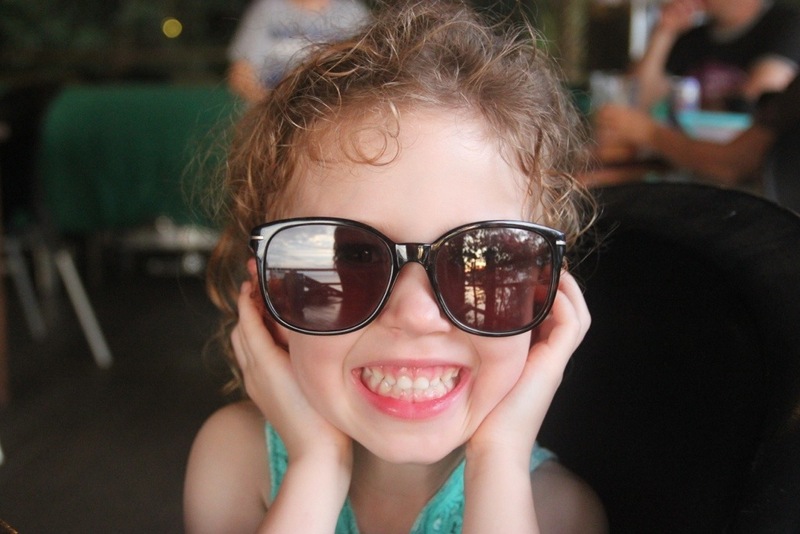 Despite that, Permai is still one of the kids’ favourite places this trip. Next post is all about wildlife spotting in the mangroves upriver from Santubong – proboscis monkeys, Irrawaddy dolphins and fireflies! Have you ever seen fireflies? They really are magical. Read about more of our Malaysian adventures in Kuala Lumpur City Centre Park, KL Chinatown and Batu Caves. Wow I so enjoyed this journey, what a beautiful untouched environment that your children will remember through photo’s and stories you embellish over time. An awesome experience. Thank you for sharing. Thanks, Kath. Pristine is definitely the word to describe Permai. It was a beautiful place to share with the kids. Looks gorgeous, and the photo of Phoebe is just divine. I remember going on a boat to a national park near Kuching somewhere and seeing proboscis monkeys as we went along, I’m pretty sure… oh happy memories of adventuring!! Thank you! Happy New Year to you too. LOVE Sarawak! Hi Gill, so exciting to be headed to Kuching. Sorry for the slow reply. We stayed at the Ariva, which has two bedroom units and wifi and a pool. Not especially fancy but was good for us. As for the torches, our taxi driver loaned them to us. 🙂 Happy travels! Reading this reminds me of our visit there. If anyone’s think about staying I definitely recommend it, it’s as amazing as the photos look. I’d also recommend hiring the boat for the day and visiting some of the islands and mangrove forests. We were lucky enough to see some Irrawaddy river dolphins as well. Another good experience was the jungle night walk. 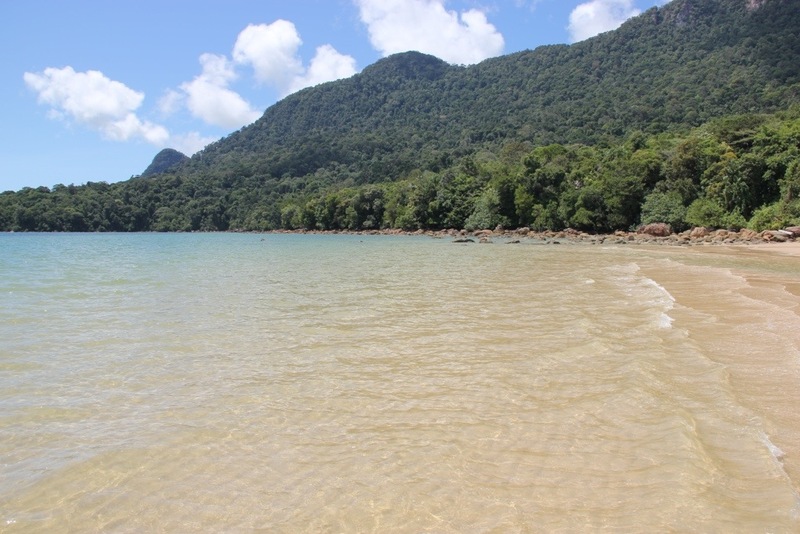 Bako national park is pretty close by and worth a trip if you’ve got a few days to spare, it’s only accessible by boat so is quite remote and an excellent place to see proboscis monkeys.